Custom Insert Medals Ship In 24 Hours! Upload your logo, and submit your order! Receive a color proof for approval before production begins. Choose Your Color Shooting Star Medal! Glossdome Covers Give Your Medal A Bright Extra Shine! Upload A Different Logo On Each Side! Crown Awards Custom Insert Medals are a unique way to increase your name recognition while simultaneously awarding your team, employees, clients and business partners alike. Here at Crown Awards, we are proud to offer the largest available selection of custom medals anywhere! From beginning to end, we will work directly with you to develop your personalized gifts. Creating your own individually designed custom logo medal is simple. 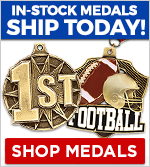 Order as low as 30 insert medals and they will be assembled and shipped within just 24 hours. With a fast turnaround, our custom insert medals are the perfect way to incorporate your team name, organization, or logo into a beautiful medal! Your Crown Custom Insert Medal is sure to be one-of-a-kind. Our artists can recreate your existing design/logo or produce new artwork at no obligation. If you don't see what you are looking for, call our custom department to help guide you through every step of the process no matter how large or small your budget may be. To receive the perfect custom insert medal of your choice, call us today at 1-800-227-1557! Why Crown Custom Insert Medals? As America's largest awards manufacturer and with over 40 years of experience behind us, Crown's custom medals & awards are sure to fit your gift-giving needs. Crown Awards is here to provide our customers with the highest quality products at the lowest prices available, making us your custom made medal manufacturer of choice. Our staff is available Monday through Sunday to answer any questions you may have regarding your custom order. Pick up your phone and speak with a custom insert medal specialist today, 1-800-227-1557! If you need under 30 medals, then check out our great line of stock medals.